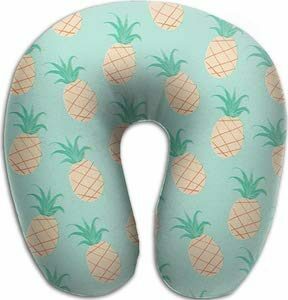 Travel pillows are a great way to take a nap on a trip but why go boring when you can have a fun pineapple travel pillow like this one. This travel pillow is a light green in color with on it in light colors lots of pineapple. Besides all that it is just a travel pillow and it is made from memory foam to make it nice and comfortable and easy to take on your trips. So train, car, or plane this pillow should be the first thing you think about taking. Nap time will be way more often and comfortable all thanks to this neck pillow. This entry was posted in Uncategorized and tagged fruit, pineapple, travel pillow. Bookmark the permalink.